The Pomegranate Awards Ceremony on the Opening Night of the American Sephardi Federation's New York 21st Sephardic Film Festival celebrates Sephardi excellence in the arts. Past recipients include Senior Counsellor to the King of Morocco André Azoulay, French-Algerian recording legend Enrico Macias, Kuwaiti star and human rights activist Ema Shah, and Morocco-Israeli poet Erez Bitton. 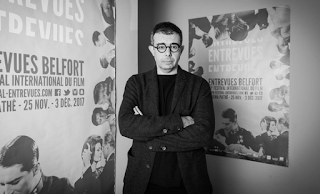 This year's recipient is Said Ben Said (pictured) , the Franco-Tunisian producer who took a courageous stand for coexistence against Anti-semitic extremism. A prominent Tunisian-born movie producer, he has denounced the systemic and deep-rooted anti-Semitism in the Arab world, after he was excluded from North Africa’s most prestigious film festival because of his work with Israelis, The Tower reported. Said Ben Said 's invitation to preside over the jury of the 28th Carthage Film Festival in Tunisia had been revoked as a result of his collaboration with Israeli film director Nadav Lapid and his involvement in the Jerusalem Film Festival. “No one can deny the misery of the Palestinian people, but it must be admitted that the Arab world is, in its majority, antisemitic,” Ben Said wrote. “This hatred of Jews has redoubled in intensity and depth not because of the Arab-Israeli conflict, but with the rise of a certain vision of Islam,” he added, referring to the problem of Islamist extremism. The ten-day ASF Film Festival features premiere film screenings and documentaries, followed by Q&A with filmmakers, as well as special honorees and guests. This year's film line-up includes Jews of Syria 1930 - 67 by Lisa Ades, a 2010 Mexican fim by Mariana Chenillo called Nora's Will, as well as an 1959 classic called Stars, in which a Nazi officer falls in love with a Greek-Jewish girl. Laura Bialis's popular documentary Rock in the Red Zone and a new production by David Deri called the Ancestral Sin focus on the lives of Mizrahim resettled in development towns. On 11 March at 5.30 pm, there will be a screening of Starting Over Again, Elliot Malki and Ruggiero Gabbai's film about displaced Egyptian Jews. It will be followed by a Q&A with Viviane Acker-Levy and Lucette Lagnado.